This commercial-grade flag measures the standard 3' tall and 5' across. Backed by a heavy canvas heading, full brass grommets, and its sturdy 100% Nylon fabric, this flag will stand up to years of abuse. The current Wyoming flag was adopted January 31, 1917, following a state contest to design the flag. 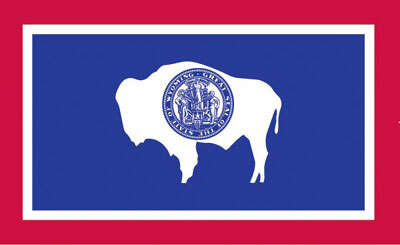 The Bison is "branded" with the Great Seal of the State of Wyoming. The bison was included because one of the nicknames for Wyoming is "The Buffalo State." The other nickname, probably more famous today, would be, "The Cowboy State." The official motto, of course, remains, "The Equality State," as Wyoming was the first state to permit women to vote in elections.